Week 1: An unforgettable fable that proves love, family and imagination conquer all. As I mentioned in my New Year’s resolutions post, one of the challenges I’ve set up for myself is to watch 52 Movies. Cristiano and I discovered that we both had only seen about 25-30% of the Top 250 Movies on IMDB, missing a lot of the classics and just general good movies I never got around to seeing. So every week we’ll be watching one of these movies and I’ll try to blog about it. For this first week we did La Vita è Bella, at the moment #87 on IMDB. I had told my brother about my idea of this challenge before Christmas, so (of course and great that I did) I got two DVDs of two movies I hadn’t seen, one of which was La Vita è Bella. The first half of La Vita è Bella is set in the 1930s Italy. Guido (Roberto Benigni) has just moved to a small town in Tuscany where he falls in love with a schoolteacher, Dora. She’s already engaged, but the playful Guido manages to woo her in surprising and unusual ways. The story then jumps ahead to five years later; Guido and Dora are living happily together with their son, until they get sent to a German concentration camp. Guido does everything in his power to get this family through this ordeal. There were a couple of reasons why I had never seen this movie. For starters, (I know this sounds a bit lame, but this is truly one of my reasons) I tend to watch (or at least start watching) a movie during dinner, and films with subtitles… not that handy when every other minute you have to look down at your plate (told you it was lame). Another reason was that every time I saw a clip or something else with Roberto Benigni in it, I just got completely exasperated by him. He’s so busy and bubbly and peppy, it’s tiring to watch him (I have the same with a Dutch comedian Bert Visscher; it’s too taxing to watch). And for that first half of the movie, he is very much busy and bubbly and peppy. But in an endearing type of way. The way he woos Dora is just so sweet, you can’t find it irritating (still a bit tiring though to be honest). And when the second half of the movie hits, when this character that is so busy and bubbly and peppy lands in a concentration camp, he remains busy and bubbly and peppy. 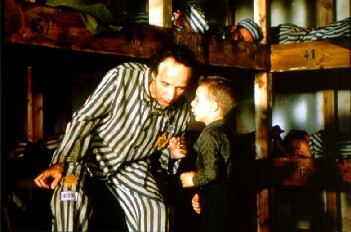 In a unique way, he keeps his son hopeful, never letting the harsh realities of the war affect him. I’m not one to cry that often during movies, but the end of La Vita è Bella had me slightly in tears (not too much, mind, and not until the last minute). It’s a sweet story, and at it’s heart you could say it’s a bit of a fairy tale, even though it’s set in not the most fairy tale-ish of places. One note: if you’re avoiding this movie because it’s a “war-movie-drama”, don’t. You’re missing out on a great tale of hope and love (not to sound too soppy). 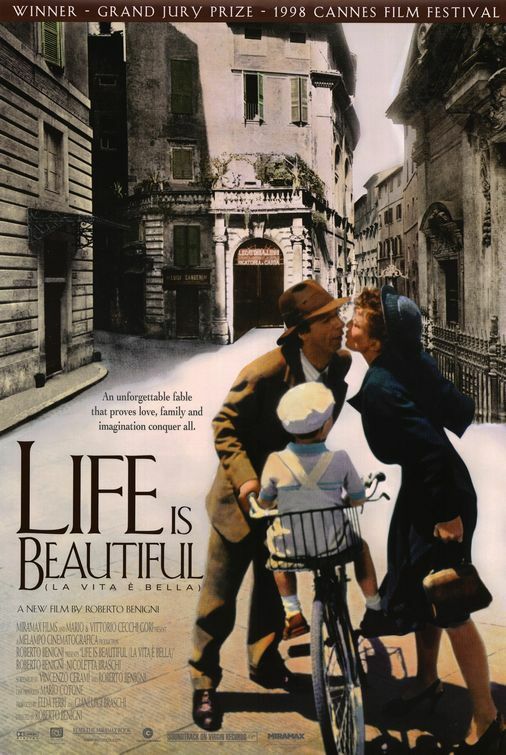 La Vita è Bella deserves to be in the Top 250 of IMDB, maybe even a little bit higher than #87. If you haven’t seen it yet, you should. Trust me, it’s a film you’ll always remember.